THE FORMER PRIME MINISTER has been connected with the Hypo bank since its entry into Croatia in the 1990'sThis week in Austria a special investigation unit, the Sonderkommando or Soko Hypo, will be established and begin investigating all of the business transaction of the Hypo Group Alpe Adria bank, specifically the connections between the bank and former prime minister Ivo Sanader, Ivic Pasalic, the one time influential advisor to the first Croatian President Franjo Tudjman, and general Vladimir Zagorec. Informed Austrian sources told Nacional that this unit would begin with a detailed investigation into 13 cases in which Sanader intervened in the Hypo Alpe Adria bank in Austria for various loans. The fact that Sanader intervened in the bank at least 13 times was uncovered by the heads of the Hypo Alpe Adria bank in a report on the banks status they were obliged to send to the Austrian national bank. Events surrounding the bank, following many years of agony that were marred by various scandals, ignited an unbelievable drama in Austria only a few days ago. At the end of the dramatic sequence of events it was decided that the bank would returned to state ownership, and that prior to this all of its co-owners would have to deposit onto the banks account hundreds of millions of euro, but also that some of the losses would be recuperated from the Austrian taxpayer through the state budget. That was the primary reason for establishing the Soko Hypo special investigation unit, which will be comprised of ten financial and business experts. The unit could finally shed some light on the numerous suspicious business transactions of the Hypo Alpe Adria bank, in which, at various levels, a number of influential Croatians, led by former Prime Minister Ivo Sanader, Ivic Pasalic and Vladimir Zagorec, were involved. When reporting on the issue, the Austrian media have begun using the opportune acronym K.u.K. - Kroatien und Korruption (Croatia and corruption). In Austria the dramatic outcome of the Hypo Alpe Adria bank crisis, created an altogether new situation, which could assist Croatian authorities in the search for money stolen from funds intended for Croatia's defence. Because of the bank's large losses in Austria, previous investigations had already been initiated, but the circumstances were somewhat different. Informed financial circles in Austria confirmed for Nacional that during those investigations there may have been some calculating, so as to not directly harm Austrian interests, and the Hypo Alpe Adria bank's business in Austria, as well as in Croatia. An Austrian political source confirmed for Nacional that these circumstances are different this time around. It is predicted that the special investigation unit will, this time around, not calculate at all in its investigation of illegalities, specifically with regards to those connected to the bank's business dealings in Croatia. Nacional learned from informed legal sources that last week the competent Austrian institutions once again contacted the Croatia State Attorney's Office, in an effort to intensify cooperation that is ongoing since the extradition of Vladimir Zagorec as a result of the gem scandal. A date has not yet been set as to when Soko Hypo representatives will meet with representatives from the Croatian State Attorney's Office, but it will happen very quickly. "We agreed to intensify our already good cooperation and concluded that the issue in question is very serious, in which we must reciprocally assist one another, because that is the only way to bring things to a conclusion. Our Austrian colleagues told us that they too could not complete their investigations without Croatian assistance, and we informed them that we could not resolve some of our open issues without Austrian help. We cannot do this individually, both sides are aware of this, and now we can begin to talk of the launch of a new phase of cooperation, which will certainly lead to good results," an informed legal source in Croatia told Nacional. Some members of the Austrian police team investigating Vladimir Zagorec's business dealings, following his legal problems in Croatia, will also be joining the Soko Hypo. One of the Austrian investigators that will participate in the work of the special investigation unit told Nacional that Soko Hypo will correlate their information on Zagorec with the new circumstances that are now under investigation in the Hypo Alpe Adria bank. Informed Austrian financial sources revealed for Nacional that on the request of the Austrian national bank, the heads of the Hypo Alpe Adria bank had already sent a special report to the Austrian national bank regarding the situation in the bank following the latest turmoil. In that report a special section deals with suspicious business dealings with Croatia, specifically with cross border financial transactions, through which projects in Croatia were financed directly from Austria. Those financial transactions in fact went directly from the bank's headquarters in Klagenfurt to Croatia, circumventing the bank's branch offices in Croatia. This was done partly because of the fact that the Croatian National Bank's regulatory controls were less expensive, but primarily because these arrangements ensured that no one from the competent state institutions would have any insight into the structure of these transactions, in which, for the most part, privileged individuals were involved. Particularly analyzed in the report was the influence that Sanader, Pasalic and Zagorec had in the bank's business. The three of them were influential officials of the HDZ government at the time of the bank's entry into the Croatian banking sector in the 1990's. They later parted ways politically, but until recently, each in his own way, through private contacts with high ranking officials from the bank, continued to influence its business dealings, and were in reality informal allies interested in the bank's expansion in Croatia. This is how the decision on the entry of the Hypo Alpe Adria bank into the Croatian market was described in a secret intelligence report on the bank's business dealings, said to have been prepared for the needs of the Bayerische Landesbanke prior to its entry into the ownership structure of the Hypo Alpe Adria bank, a document Nacional wrote extensively on this past summer. "In the mid 1990's Franjo Tudjman approved an Ivic Pasalic project based on Tudjman's idea of 200 families that would govern Croatia's assets, after which Pasalic entered into more detailed negotiations with Jörg Haider and the Hypo Alpe Adria bank through the mediation of Walter Wolf, Ivan Jakovcic and Ivo Sanader. As a cover for the Tudjman-Pasalic project, cooperation was established between Istria County and the Austrian state of Carinthia, as well as the entry of the Hypo Alpe Adria bank into Istria County. After this the bank began to massively buy up at discount rates real estate and agricultural land in Istria... The Croatian political leadership chose this bank because through it they had spun more than one billion dollars of siphoned-off Croatian money that, with the assistance of pseudo-investment funds that were conceived of at the Hypo Alpe Adria bank, were continually dumped into Croatia and some other countries in the region. All of this was done pursuant to an agreement between Ivic Pasalic, Günter Striedinger and Wolfgang Kulterer." All of the above mentioned shows how Sanader, Pasalic and Jakovcic had at the time cooperated in the same project. In the report submitted to the Austrian national bank by the Hypo Alpe Adria bank, it is noted how Sanader significantly influenced various projects being financed by the bank. For now, among the bank's documents, not a single lead has been found that would indicate that Sanader could have had any personal benefit directly from the Hypo Alpe Adria bank, but this does not mean that it is not the case. Sanader could have benefited in other ways, from people or companies that profited on the basis of his interventions in the Hypo Alpe Adria bank. In the same report it is established that Sanader primarily used his influence to ensure that loans for Istria County be approved. This involvement on his part directly explains why Sanader always had good relations with the head of the IDS, Ivan Jakovcic, even though in the public eye they always left the impression that they were political rivals. In this context the previously mentioned 13 interventions by Sanader for various loans approved by the Hypo Alpe Adria bank are being investigated. In the 2007 intelligence report on the business dealings of the Hypo Alpe Adria bank, of which Nacional has a copy, Milan Naperotic is cited as a key liaison for all of the projects the bank was financing in Istria, along the lines of the Sanader-Jakovcic agreement. "Milan Naperotic is a long time bank advisor in Klagenfurt, who researched, negotiated and then suggested to the headquarters whether or not to approve loans to any major bank project in Istria. His strong position in the bank was based on his very strong business and even more so his personal relationship with Günter Striedinger. Through the bank and its money Naperotic also established strong political connections with the HDZ, SDP, and specifically the IDS. In Istria Naperotic gathered for himself a team of very loyal people, who were privy to information and could affect change to the zoning of land in Istria, and partially in Zagreb as well... Naperotic together with Jakovcic went to Sanader to push the Brijuni riviera project, which foresees the construction of tourist accommodations on land that in a very dubious way was rezoned as residential-commercial land, after being bought by the Hypo Alpe Adria bank. A pleased Naperotic commented that the bank was responsible for bringing Jakovcic and Sanader together." 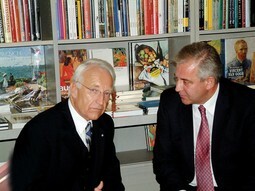 SANADER AND STOIBER The former Bavarian prime minister publicly boasts that he influenced the sale of HypoIn the same report, spanning a number of pages, projects involving Naperotic and the bank are described in great detail. Here are some short excerpts regarding Naperotic's involvement. "Naperotic made sure that a mortgage for Zagreb Mayor Milan Bandic be approved under extremely favourable conditions, because business in Zagreb is conducted through Bandic. Naperotic gave Pasalic information that Ivo Sanader had in the mid 1990's taken an 800 thousand Deutsche Mark provision from Miroslav Kutle for helping him get a 4 million Deutsche Mark loan from Hypo Alpe Adria bank. Naperotic also, using a middleman, took care that, following oversight in the Hypo Alpe Adria bank conducted by HANFA and the Croatian National Bank, Ivo Sanader suggest to Mladen Bajic that the report be fine-tuned and cleaned-up because of any eventual attacks on the bank or Sanader in an election year." 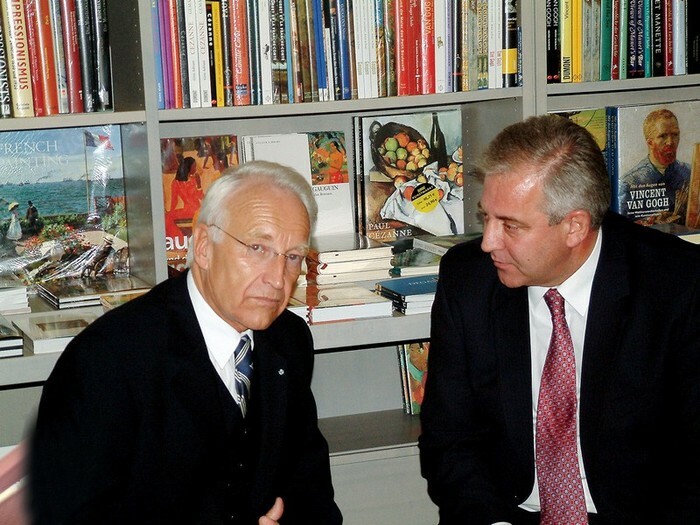 For years Ivo Sanader, the former Croatian Prime Minister and now the honorary president of the HDZ, had great influence on the segment of Hypo Alpe Adria bank's business that was connected with Croatia and very close ties to the former Austrian management of that bank. An Austrian source close to the Hypo Alpe Adria bank confirmed for Nacional that at the end of the 1990's Sanader was one of the people most responsible for the fact that the bank had an exorbitantly high number of loans in Croatia that were covered through state guarantees. 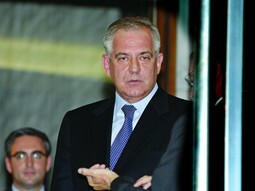 The same source claims that Sanader's involvement was at the time of use to both the bank and Croatia, but that this would change, and that he later used his initial involvement as cover for his personal influence on the banks dealings, specifically in some transactions from which the HDZ or he personally could have indirectly or directly benefited from. The same Austrian source also claims that Sanader primarily exerted his influence over the banks dealings through the bank's former head Wolfgang Kulterer, with whom he allegedly has a close friendship since his their student days. For years Kulterer had been known to boast to managers of the bank's Croatian office of his close relationship with Sanader, especially during Sanader's time as Prime Minister, the same Austrian source told Nacional. Kulterer was at the head of the Hypo Alpe Adria bank in Austria until 2006, after which he was tried for doctoring the banks business ledgers. At the trial he stated that the door to business in Croatia had been opened for the bank by Ivo Sanader. "Because of his role in the 1990's Sanader considered himself called upon to have influence over the bank's business dealings. He would even place calls for people close to him, like his former bodyguard Stipe Cacija. He wanted the bank to continue financing some of his private projects, and when these requested were not met, he would become very angry. He considered it normal that his suggestions be taken into consideration. Kulterer was very close to him, he knew how to make good use of their relationship, perhaps even for his own benefit, but the bank did make some decisions on its own. Sanader was very insulted when Kresimir Starcevic was named to the management board of the bank's Croatian offices, because he did not consider him to be a person close to the HDZ. The bank however, nurtured good relations with a number of other political options because that too was good for business. That is how the bank via Austria could finance not only the HDZ, but also the IDS, and partly a wing of the SDP close to Slavko Linic," Nacional's source close to the Hypo Alpe Adria bank stated. This is how the intelligence report describes how political parties were funded. "Miro Oblak was the co-owner of the Savudria based company Rezidencija Skipper, an Austrian businessman who donated the HDZ 2 million kuna for the 2003 elections. Oblak has business connection with Vladimir Zagorec, and together they organized the smuggling of weapons through Oblak's companies, for which the financial transactions were carried out by the Hypo Alpe Adria bank. In his 2003 donation to the HDZ Oblak served as a cover, so that it would not be ascertained that the donation actually came from the Hypo Alpe Adria bank." Given the new circumstance surrounding the issue, if Sanader had been directly involved in any suspicious arrangements with the Hypo Alpe Adria bank, this could be uncovered and served to the public very quickly. Nacional's political source in Austria had this to say about Sanader. "The old adage that it is easier for a person to trip over a small pebble than a large mountain, is well known. If Sanader had any direct, suspicious arrangements with that bank, it will now become public knowledge, because the Soko Hypo investigators will spend years investigating the smallest details that could be contentious." Austrian media began mentioning Sanader's name in the context of possible wrongdoings as early as last week. An insulted Sanader rejected these claims, announcing libel suits against the journalists in question, who according to his claims have deeply upset his family with their insinuations. Sanader's name was initially mentioned in connection with illegal activities because the Austrian media had begun writing about his great influence on the bank's business dealings, but also of the alleged 800 thousand Deutsche Mark provision he took from Miroslav Kutle for arranging a 4 million Deutsche mark loan from the bank for Kutle. Following these recent events, it has been commented in Austrian political circles that Sanader had to step down because he was faced with an ultimatum from strong international politicians. One Austrian political source told Nacional that any eventual secret bank accounts of Sanader's would be of interest to at least five countries - Croatia, Austria, Switzerland, Germany and the United States. All of this will create new problems for Sanader, but in contrast to the situation in Croatia, he can do very little to influence the development of the situation in Austria. Besides about Sanader, the Austrian media have written extensively about Vladimir Zagorec's and Ivic Pasalic's connections with the bank. The Zagorec connection to the Hypo Alpe Adria bank has confused both experienced Austrian bankers and investigators. KEY PEOPLE The late leader of Carinthia Jörg Haider and the former head of Hypo Wolfgang KultererIn the report that the Hypo Alpe Adria bank submitted to the Austrian National Bank it is established that some of Zagorec's assets are under mortgage at the bank, and that he even has some money deposited in the bank. However, it is concluded that all of this is considerably less than the amount of the loan the bank approved for him. The main question presenting itself in Austria now is who offered guarantees for Zagorec, and where are the 260 million euro the Austrian state attorney's office claims he received from the bank, if they even exist. Nacional's sources in Austria have revealed the name of an Austrian businessman, who because of his, until now, unknown ties with Zagorec, has piqued the curiosity of investigators, but with the request that we not reveal his name to the public in the interests of the new investigation. According to the same sources, the Austrian authorities had wanted to question Zagorec's wife Klerisa, but she declined. With all of the problems he is already facing, Zagorec could find himself looking at a few more. Some of the loans for the projects the bank was financing will soon be due. In question are multi-million euro loans for which Zagorec's company committed itself to return in one payment after a couple of years. Given that all of these projects have ground to halt as a result of his legal problems, it is possible that the bank will take over his projects. In the same report to the Austrian national bank, arrangements received by Ivic Pasalic or companies that are connected to him are also mentioned. It is established that these loans were approved for Zagorec, regarding less risky projects. The tale of corruption in Croatia that is connected with the Hypo Alpe Adria bank will continue in Austria over the next few days. The banks losses, which Austrian taxpayers will have to foot part of the bill for, has also instigated some political drama in Austria. The Austrian government must explain to the Austrian people why taxpayers have to bailout the bank and who is responsible. That is why the investigation has been initiated. The Austrian media have already singled out Ivo Sanader, who no longer enjoys the political protection of leading Austrian politicians and has lost the bulk of his political power in Croatia, as possibly one of the key guilty parties. In Austria a fraction of Haider's former party has split and joined Heinz Christian Strache's right leaning Freedom Party of Austria, and the debate between politicians has gone so far that some have begun advocating that Austria, because of losses relating to the Hypo Alpe Adria bank, give the Carinthian region to Slovenia. It is interesting that so far no one has seriously looked into how it is possible that the Bayerische Landesbank has for nearly three years been a majority owner of the Hypo Alpe Adria bank, and that it did not even suspect any major problems. 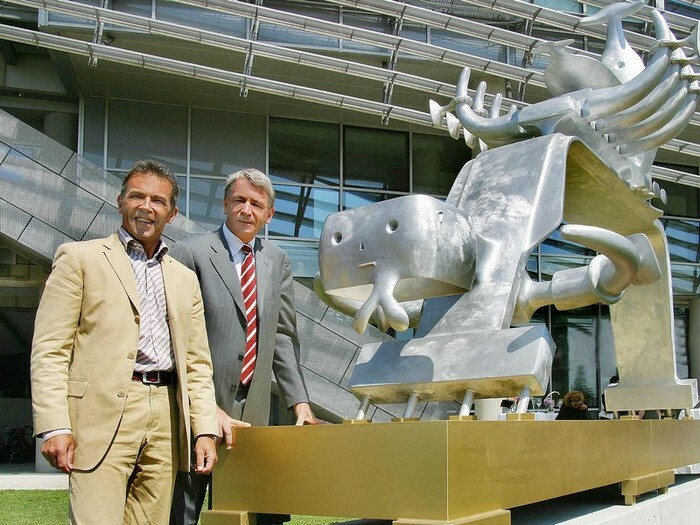 This story has also begun to unfurl, but the first issue being commented in German media, is who convinced that bank to enter into the investment, which has once again raised the name of Ivo Sanader. Former Bavarian Prime Minister Edmund Stoiber has found himself on the receiving end of criticism because he lobbied for Bayerische Landesbank prior to the purchase of the Hypo Alpe Adria bank. In detailed interviews given by the governor of the Croatian National Bank, Zeljko Rohatinski, for some newspapers, he stated that Sanader had informally involved himself in the situation. Rohatinski said that Sanader, as well as the incumbent Finance Minister Ivan Suker, had applied pressure so that he would approve the re-entry of Bayerische Landesbank into Croatia, after the German bank had in some previous instances conducted itself incorrectly. According to the claims of Zeljko Rohatinski, both Sanader and Suker insisted that this was of great importance for Croatia. In light of the new circumstances perhaps it will now be investigated whether or not it was of vital importance for some of their private interests as well. For them it is especially uncomfortable that these questions are primarily being asked abroad. It is therefore easily possibly that these murky dealings in Croatia will continue to be used as the primary fuel for various political exchanges in the countries of the region. For now, all of these exchanges have one common thread - Ivo Sanader is mentioned as a key actor in all of them.